Photos from our summertime island hopping adventure in Greece. So beautiful! We flew into Athens, and out of Mykonos. We took ferries between Athens & Santorini, and between Santorini & Mykonos. We found the ferries on this website: http://www.ferries.gr/. You buy it here and then you pick it up at the port. I recommend this so you can be sure you have space and don’t have to worry about getting them there. I’m not sure if that made it more expensive though, but probably not by much. We only had about a day there but I thought that was enough. 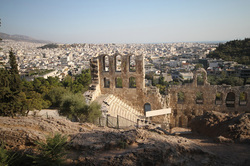 There aren't that many sights to see in Athens. Plaka - area with lots of shops, restaurants, bars. Good to walk around in the evening. Busy, touristy area. Very beautiful island. We took a ferry from Athens to get to Santorini. You can take taxi around, but we did rent a car for a day that made everything a lot more convenient since the island is fairly small but just large enough that taxi would be pretty expensive to go all around. I think we spent about 45 euros total for the rental for all day. I recommend staying on the Western coast (Caldera) because that is the side that has views of the caldera and the side with the white buildings. We stayed in Imerovigli, but the other options are Fira and Oia. I heard Arc Houses were nice too. Oia - I thought this town was one of the most beautiful and one of the best places to view the famous Greek sunsets. Naoussa Tavern - in Fira town - delicious, authentic Greek food. Very crowded and they even give you wine while you’re waiting. The staff is very friendly! Transportation is pretty terrible on the island so plan accordingly. There are supposedly only 30 taxis on the whole island, so don’t rely on that. Other than that there are buses but they don’t go that frequently. So, I’d definitely recommend staying in Mykonos town because it’d be easier to get around from there I think. I’d recommend staying in Mykonos Town because it’s easier to get around from there. Mostly for partying, so definitely all the daytime parties/beach. People go out late. Around 2/2:30 I’d say, and don’t get back until 6-7am. The second night we went to Mykonos Town and went to Scandinavian Bar which was REALLY fun. They have a club part upstairs and the music was really good. Kounelas Fish Tavern - in Mykonos Town - really good seafood restaurant. Very friendly staff. My favorite dish was the risotto.